I'm a big fan of real pumpkins and gourds. Every Autumn, I'm the first person in line to buy pumpkins. Ain't nothing like the real thing. But I like to have some plastic pumpkins and gourds, too. 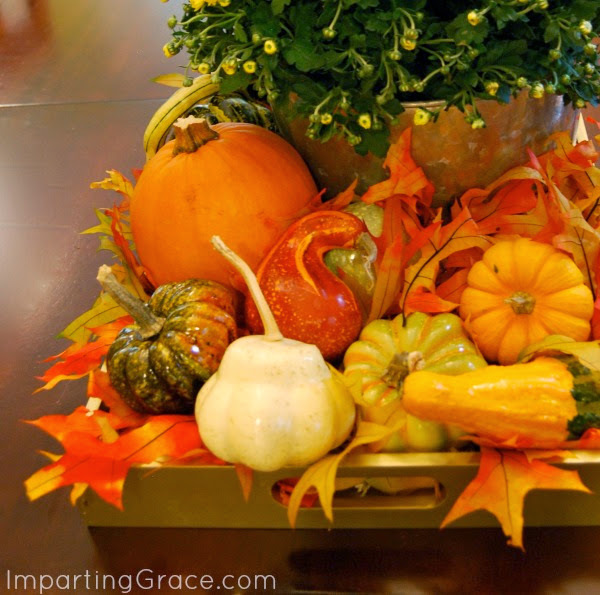 I use lots of pumpkins and gourds in my Autumn decorating, so it's nice to have some things that last from year to year. I just don't want them to look plastic, you know? So I've figured out a way to make plastic pumpkins look like the real thing. 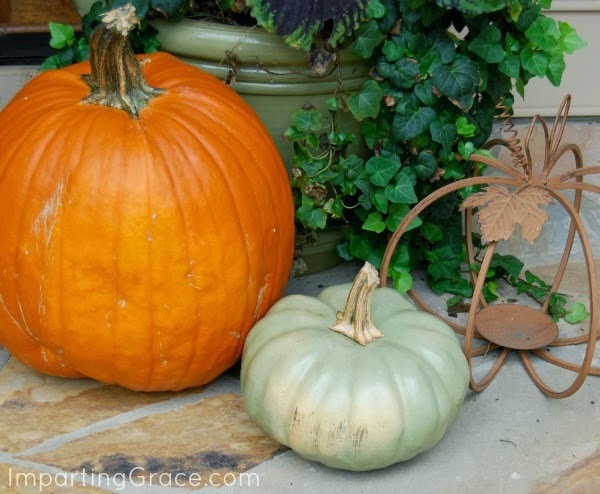 Last Autumn, I cut the stems off all my real pumpkins and gourds. That was super-easy to do with gourds and baby boos. Cutting the stems off our jack-o-lantern pumpkins took a little more effort and a very sharp knife. Then I plopped them all into a bowl and left them. My husband thought I was crazy. Here's how one of the stems looked after it dried. This Fall, I bought a faux pumpkin at Michael's. It was pretty realistic-looking, I thought. First I wiped it with gel stain. This made a big difference--the stain lessened the plastic sheen and settled into the scuffs to look like dirt from the field. Then I removed its plastic stem with a pair of pliers; it came off very easily. 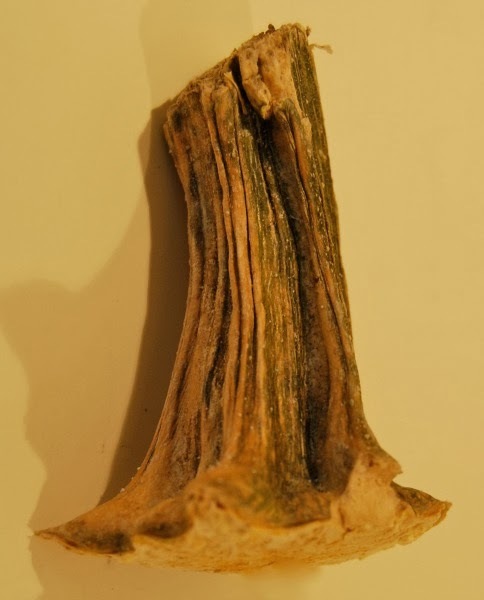 Finally, I simply hot-glued one of my beautiful dried stems to my fake pumpkin. Looks pretty real sitting on my front porch, don't you think? I did the same thing with the gourds, using stems cut from last year's real gourds and baby boos. I found some very realistic-looking plastic gourds at Michael's, but the stems screamed "Fake!" 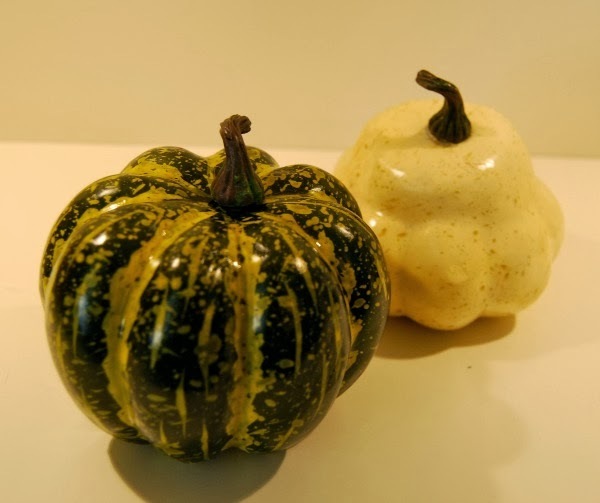 Now look--can you tell which gourds are fake and which are real? 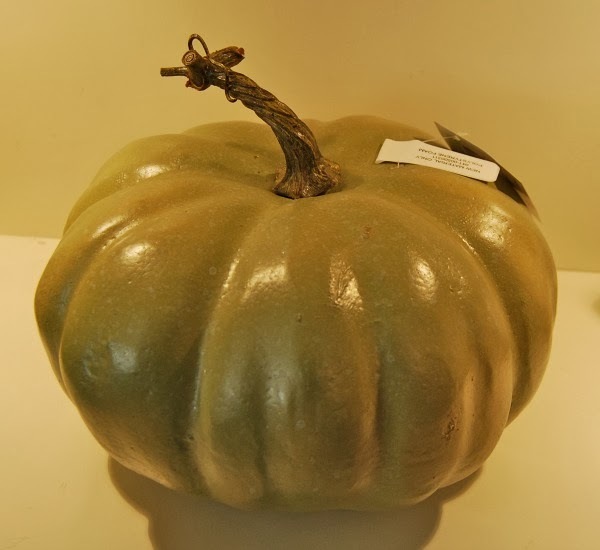 Next I'd like to make some velvet pumpkins, and I'll certainly use real stems for those. 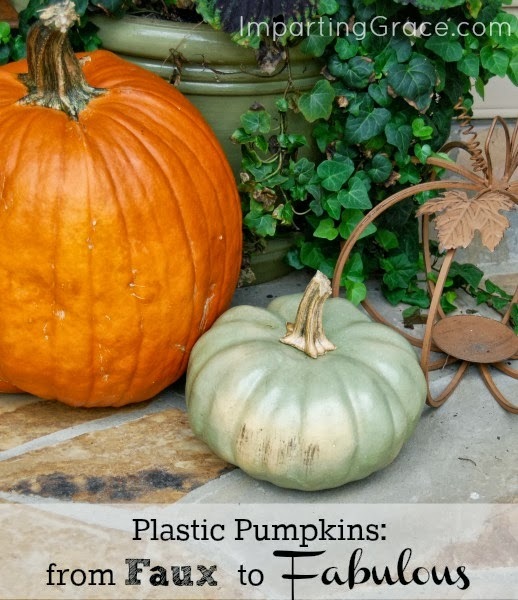 So before you toss your real pumpkins and gourds into the compost heap, cut off those stems. When Fall rolls around next year, you'll be all set! How's the Fall decorating going at your house? they all look fabulous.. I only saved a few and I definately need to save more this year..
thanks for showing us your beautiful fall~! Your pumpkins look real for sure! So funny, I have another friend who posted just about the same thing about saving stems. She is a real sweetie and very artistic! You might want to read her post (9/19/13) at susieharrisblog.com. Hey, Now that is a really smart idea! I am gonna try it and see if it will look as good as yours! I put my Fall wreath up today LOL But I do have a wheel barrel full of pumpkins to place around here soon. What a great idea! I did have the insight to keep all of my stems from last year but I had no idea what I would be doing with them. Now I know!! The real stems make all the difference! Love your idea.